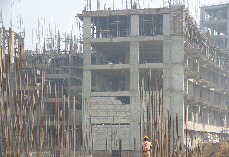 EABASSOC Foamed Concrete is used for making lightweight blocks in many countries, including India, China and Thailand. The lightweight foamed concrete blocks are mainly used to build partition walls. The lightweight nature of the blocks means that they impose a minimum loading on the building. 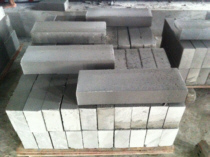 Foamed concrete blocks also provide good thermal insulation and sound insulation. Modern, automated foamed concrete block factories use a wire cutting machine to efficiently cut large blocks into small blocks. Setting up a basic foamed (cellular/CLC) concrete block making factory requires a minimum financial outlay for equipment. Blocks can be made with virtually any dimension. Popular sizes inlcude 100 x 200 x (400 / 500 / 600mm). Pre-Cast panels can also be made from foamed concrete. The latest innovations are 60 x 50cm interlocking panels and 1.2m hollow-core, interlocking panels. These can be built into a non-load bearing wall far more quickly than small blocks, whilst reducing the overall loading on the building. EABASSOC Foamed Concrete has low water absorption and a closed cell structure. When it rains water does not pass through the foamed concrete. EABASSOC Foamed Concrete is also very useful for void filling. As it is very fluid it will pour into even the most inaccessible places. It can be used for planned work, but also in emergencies to provide stability and support very quickly. EABASSOC Foamed Concrete has been used to fill old sewers, basements, storage tanks and voids under roadways caused by heavy rain. It can be applied even through small openings making the work much easier and cheaper than other methods. If necessary, it can also be pumped into position over considerable distance. When used in void filling, foamed concrete can be classed as Flowable Fill, Controlled Low Strength Material (CLSM) or Low Density Controlled Low Strength Material (LD-CLSM). READ MORE: The Use of Foamed Concrete for Void Filling (pdf). For many years, EABASSOC Foamed Concrete has been supplied for roofing insulating in the Middle East. A low density mix is chosen and the resulting air content gives the material excellent thermal insulation properties. The low density also has the advantage that it does not significantly add to the overall weight of the roof. Roofing insulation is probably the most widespread application of foamed concrete. Foamed concrete has two benefits when it is used for roofing. The first benefit is that it provides a high degree of thermal insulation. The second benefit is that it can be used to lay a flat roof to falls, i.e. to provide a slope for drainage. In countries where roofs are flat and where roof surfaces are used as part of everyday life, foamed concrete is strong enough to support foot or even vehicular traffic on the roof. Foamed concrete is also much lighter than slopes made from mortar screeds. This means that a roof with a slope made of foamed concrete imposes a lower loading on the structure of the building. READ MORE: The Use of Foamed Concrete for Roof Insulation (pdf). EABASSOC Foamed Concrete is particularly suitable for bridge abutments because it does not impose the large lateral loads, which can be a problem when using traditional granular materials. With traditional abutments, there is a lot of sideways pressure against the bridge walls caused by the materials used and their compaction. Using EABASSOC Foamed Concrete, the lateral load is practically eliminated, so the bridge walls do not have to be as thick. This in turn means that the wall foundations can be made less massive. Huge cost savings can be achieved by reducing the thickness of the walls, and the size of the foundations. Traditional abutments also experience settlement, both due to compaction of the aggregates by trafficking, and due to the sinking of the whole structure into the ground if the subsoil is soft. Such settling and sinking causes subsidence of the road, which necessitates costly repair work. When EABASSOC Foamed Concrete is used there is no settling, and sinking is reduced by adjusting the weight of the abutment by the choice of a suitable mix design. READ MORE: The Use of Foamed Concrete for Bridge Abutments (pdf). 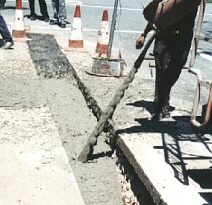 EABASSOC Foamed Concrete is an ideal material for trench reinstatement (the filling of trenches dug in roads when pipes are laid or repairs are carried out). The traditional methods of filling trenches in the roads, i.e. the use of granular fill materials, result in settlement and damage to the road and potentially, to the pipes. 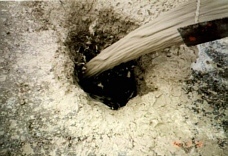 With foamed concrete there is no settlement; and because the foamed concrete is very fluid, it will fill any voids and cavities in the trench sides. Also, the excellent load spreading characteristics of EABASSOC Foamed Concrete means that axle loads are not transmitted directly to the services in the trench, so the pipes are not damaged by the weight of traffic. Traditional granular backfill materials require compaction. EABASSOC Foamed Concrete does not require compaction, so there is no need to use any compactors. This is important since the use of such tools can cause vibration related illnesses among the workers. READ MORE: The Use of Foamed Concrete for Trench Reinstatement (pdf). EABASSOC Foamed Concrete can be used to make road structures less heavy. This helps solve the problem where the traditionally heavy road structures cause severe settlement of the road, particularly in areas of soft ground. By constructing the road sub-base from a lightweight material, the overall weight of the structure can be greatly reduced. As EABASSOC Foamed Concrete is very versatile, with a wide range of densities, it has proved to be an ideal, cost effective material for solving this problem. Foamed concrete is especially advantageous when building bridge abutments on soft ground. This is due to its lightweight nature and low lateral force once set. Using EABASSOC Foamed Concrete to create a ramp up to the bridge deck can reduce a) the size of supporting walls, b) the size of the wall foundations and c) the number of piles required to support the abutment structure. This provides enormous indirect cost savings to the project when compared to the cost of using traditional granular infill materials. Bridges can be strengthened using foamed concrete, for example, by filling inside supports on masonry arch bridges, by encasing steel girders or even under filling entire sections of the bridge. EABASSOC Foamed Concrete can be used for cast in-situ walls. These can be made either by using traditional shuttering or hollow polystyrene moulds. This provides a quick and cheap method of building, with the added advantage of excellent thermal insulation. A wall made from 1200kg/m3 density foamed concrete provides the same level of thermal insulation as would a wall made from dense concrete that was 5 times as thick and made from 10 times the quantity of materials as the foamed concrete wall. 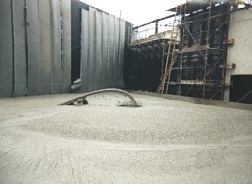 EABASSOC Foamed Concrete is an ideal material for tunnel construction and repair. It is used both for the filling of voids created and exposed during tunnelling, and for grouting the finished work, including gaps behind the tunnel lining. EABASSOC Foamed Concrete provides very good material for floor construction. It is ideal for building sub-floors quickly and cheaply and can be used for levelling terrain and raising floor levels as well as for insulation purposes. 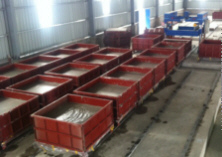 The traditional method of making lightweight precast blocks involves the addition of aluminium powder to a wet mortar mix, followed by autoclaving. This is not popular due to the pollution it causes. EABASSOC Foamed Concrete is an environmentally friendly alternative as there are no waste products in its production and all the ingredients are non-hazardous. EABASSOC Foamed Concrete can be used in various types of ground projects, including stabilising embankments after landslides, highway widening schemes, land reclamation and filling in of harbours. As it does not sink into soft subsoil, redevelopment can begin much sooner after application than can using traditional methods. For similar reasons, it is also ideal for road foundations. The excellent fire resistant properties of EABASSOC Foamed Concrete makes it an ideal material for fire breaks in buildings where there are large undivided spaces. It is used to prevent flame penetration through the services void between floor and ceiling in modern construction, and also to protect timber floors in old houses. EABASSOC Foamed Concrete reduces the passage of sound, both from background noise and due to impact. It is, therefore, an ideal material for internal walls and suspended floors in multi-storey buildings, especially ones with communal use.